Your favorite household condiments just got an exciting new twist. We've put this ketchup and mustard duo high up on a pedestal...That pedestal just happens to be our refrigerator shelf. This classic condiment set just got an exciting new twist thanks to Chitra Agrawal. Upgrading your traditional toppings with a blend of curry, garlic, and chili spices, this pair is a tasty addition to your sauce roster. Tangy, sweet, and with that kick of curry spice, these all natural options are a healthier alternative to bottles loaded with salt and sugar. 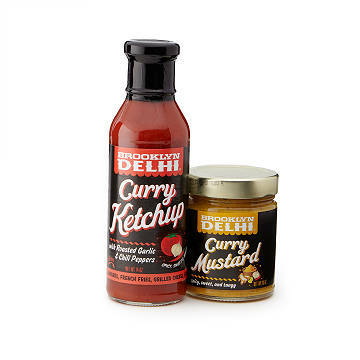 Whether you're hosting a summer soiree or an afternoon BBQ, this ketchup and mustard will add that extra layer of flavor to your next veggie burger, sandwich, or grilled cheese. Inspired by India but made in Brooklyn. Chitra Agrawal has spent years collecting recipes from generations of her family in India. Although deeply inspired by those roots, Chitra puts a spin on her traditional cooking heritage by combining new flavors and ingredients from the time she’s spent traveling abroad and living in New York City. She spends her time creating, teaching, and writing about Indian cooking — motivating us all to add a little spice to our cooking repertoire. Inspired by the local food movement, she uses healthy oils and preservatives and sources many of her ingredients from farms near Brooklyn. Learning from her parent’s example, Chitra makes sure each small batch of sauce she produces highlights that special homemade flavor.